1) What would the Earth look like with the continents uncrumpled? Many people have noticed that the continents seem to fit together, but when people try to predict what the Earth looked like before the continents began to move, they move the locations of the continents. However, in order to truly understand what the Earth looked like before the continents began to move, we would have to unfold the mountain ranges. The mountain ranges are the result of the crumpling and compressing of the land, so we cannot simply cut the continents out from a map of today and move their positions. We must uncrumple them. This will result in the continents becoming much larger, and it will result in the deposits of oil, coal, becoming closer to the surface. The images below will help to explain this. 2) Does the ocean floor slide under the continents? Or diffuse? The drawing to the right is one ofthe "official" drawings of how the ocean floor is forced under the continents, like a knife blade cutting into an Apple. However, the ocean floor is full of wet sediment, and water reduces the melting point of silica. As it is forced under the continent, it will be put under increasingly high pressure and encounter increasingly high temperatures. Is it possible that it will reach a depth at which the temperature and pressure will melt that water-saturated material? If so, it will become a liquid, even though the rock around it is solid. Therefore, it will diffuse into the continents and lithosphere, rather than penetrating like a knife blade. The drawing below shows the continents as they started to move around. The mountain ranges have been unfolded, so the continents are very large, and there are shallow pools everywhere rather than deep oceans. There are no large mountain ranges yet. 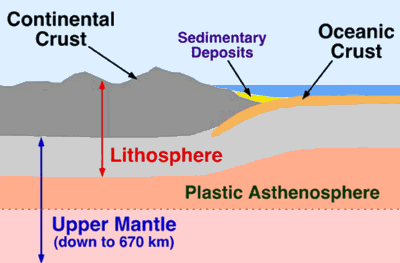 As the ocean floor is pushed down under the continent, it diffuses in to the lithosphere. 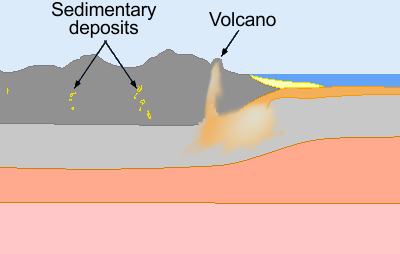 When that wet material is forced upwards, the dissolved water will create volcanoes that could be explosive, and which create pumice rather than solid rock. Why do volcanoes produce so much water vapor? Some people claim that the water on the surface of the Earth was produced from volcanoes, but it could be the other way around. Specifically, the volcanoes are producing a lot of water because the water from the surface is being pushed into the Earth at the subduction zones, and where the continental crust is crumpled. 3) Have any coal fields converted to diamond? 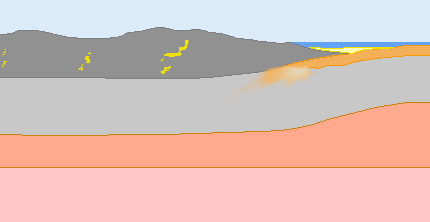 In the drawing to the right, the continents have crumpled a bit, causing the sediment from the shallow pools (yellow areas), to be pushed deep underground, and to be twisted. The crumpling of the continents can explain why some of the deposits of coal and oil are so deep in both the continents and in the oceans. 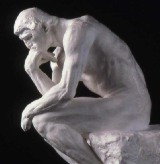 • Have any fields of coal have been pushed so deep that the entire field has converted to diamond? • How deep would they have to go in order to convert to diamonds? 4) Can we make a high-quality pumice? When I was younger, I would fantasize about a melting chamber that could hold silica and water under pressure, which would lower its melting point, and then heat it up to the point at which the water dissolves into the molten silica, and then release it so that it expands into foamed silica. I assumed that it would resemble Styrofoam, and that foamed silica would make one of the most ideal building materials, but is it economically practical to contain a material that is so hot and under such pressure?